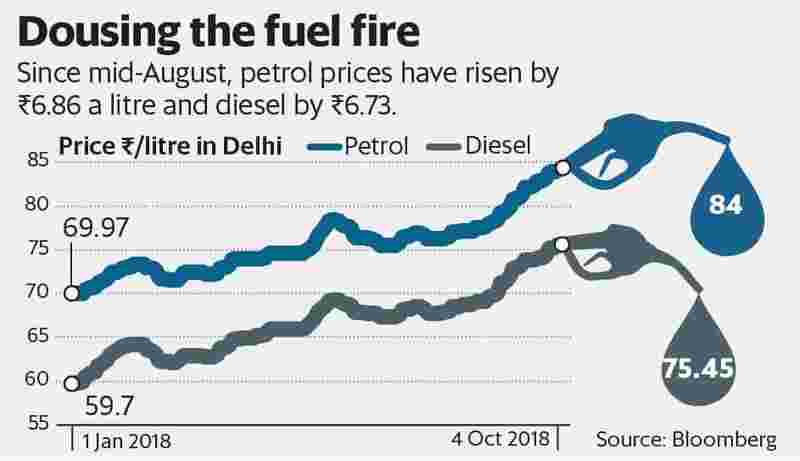 New Delhi: A day before the Reserve Bank of India’s monetary policy review, the centre on Thursday effected a ₹ 2.50 per litre cut in prices of petrol and diesel in an effort to ease inflationary pressure and boost consumer confidence. Many Bharatiya Janata Party-ruled states also cut value-added tax (VAT) on fuel by an equivalent amount at the centre’s request. Finance minister Arun Jaitley said that out of the ₹ 2.50 cut, the centre will reduce excise duty by ₹ 1.50 per litre, while state-run fuel retailers will take a hit of ₹ 1 for every litre sold. With the US sanctions on Iran round the corner and continued pressure on the rupee, the reprieve for consumers might be short-lived, analysts said. This has also raised questions about the government’s commitment to keep fuel prices outside its control. “The decision seems to be driven by the government’s worry about the political fallout of high oil prices, though the economics of it is not quite appealing," said former chief statistician of India Pronab Sen.
Jaitley said he was confident of meeting the fiscal deficit target of 3.3% of GDP this year despite the centre’s revenue declining by ₹ 10,500 crore in the second half (October-March) of the current fiscal because of the excise duty cut on fuel. “The significant increase in tax revenues gives us the comfort with respect to fiscal deficit," Jaitley said. Net direct tax collections in the six months ended September are at 38.6% of the budgeted estimates of ₹ 11.5 trillion for 2018-19, reflecting the challenge for the central government to stick to its fiscal deficit targets at a time that goods and services tax (GST) revenues are also lagging behind targets. In the six months ended 30 September, monthly GST collections averaged ₹ 96,283 crore, a shortfall of ₹ 3,700 crore, given the ₹ 1 trillion monthly target. The government hopes the festival season will improve demand and boost revenue collection in the second half of the fiscal. However, it still expects GST collections to miss the full-year target. The government’s move to ask state-run fuel retailers to take a hit of ₹ 1 per litre on petrol and diesel is against the spirit of deregulation of fuel prices. “The annual impact on (fuel retailers) would have been to the tune of ₹ 9,000 crore. However, given that it is already October, the impact will be in the range of ₹ 4,500 crore," said a senior executive at a state-run oil firm, requesting anonymity. Shares of oil marketing companies fell after Jaitley’s announcement. HPCL shares fell 14.7% to ₹ 214.40, BPCL plunged 17.1% to ₹ 313 and Indian Oil dived 14.2% to ₹ 134.95. Interestingly, the National Democratic Alliance (NDA) government articulated its intent to stay the course on fuel pricing reforms, saying it was working towards a “long-term solution". Petrol prices were deregulated in June 2010 by the Congress-led United Progressive Alliance (UPA) government. Prime Minister Narendra Modi’s government decontrolled diesel prices in October 2014. With dynamic fuel pricing introduced in June last year, the NDA government has maintained that it has no role in pricing. Taking advantage of lower global crude prices, the Modi government, however, had started raising excise duties since it came to power in 2014. Excise duty was increased on petroleum products in November 2014, followed by multiple rounds of excise duty hikes as the government looked to bridge the fiscal deficit. At present, the excise duty applicable on every litre of petrol is ₹ 19.48. Value- added tax levied across states is also similar, but varies from state to state. On Thursday, petrol and diesel were selling at ₹ 84 per litre and ₹ 75.45 per litre, respectively, in Delhi. Subsidized domestic cooking gas prices have increased by ₹ 2.89 per 14.2kg cylinder to an all-time high of ₹ 502.40. The cost of the Indian basket of crude rose to $84.43 a barrel on 3 October, according to the Petroleum Planning and Analysis Cell. With Brent crude prices continuing their upward trend and breeching the $86 per barrel mark, fuel prices in India have been touching all-time highs. Increasing tensions between the US and Venezuela, with the US demanding an end to all imports of Iranian oil by early November, and the rupee’s performance as Asia’s worst performing currency have compounded the situation and put India, the world’s third-largest oil importer, in a spot. Madan Sabnavis, chief economist, Care Ratings Ltd, said if crude prices continue to go up and the rupee falls further, the government’s move would then have a limited impact. “Therefore, the critical part is as to how long it will take for the rupee to stabilize and at what level. Further, post November, when the Iran sanctions kick in, where will the oil prices head? If it remains elevated, then there will be more acute inflationary problems for the economy."